At Camp Sequassen, our 35 foot climbing tower will offer a challenge for any level climber as well as provide opportunities for rappelling. Next to the climbing tower is a bouldering wall for climbers to practice their skills while waiting their turn to climb. When using the tower at Camp Sequassen, the camp will provide all safety equipment including helmets, harnesses and ropes. No personal safety equipment is allowed. If you wish to use your own climbing shoes or chalk bag, that is permissible. 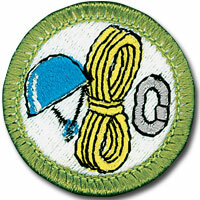 Fees include two trained and certified instructors who will instruct and assist your Scouts. Units may provide one of their own qualified instructors and, as a result, the base fee will be discounted by $60 (offer applies to one instructor only). The unit’s instructor must have completed the Climbing Instructors Training Course conducted at Camp Sequassen and/or be listed on the Council’s roster of qualified instructors. All climbing activities at Camp Sequassen must be approved in advance. If your instructor is not pre-approved for instruction, you will not be permitted to climb. Please make reservations for the climbing tower well in advance to allow for securing the necessary instructors. Climbing Programs are available in the months of September, October, November, April, May and June. To reserve a climbing session, contact Carolyn Cruson, Camping Registrar, at the Council Resource Center at 203-951-0237. Check back here for information on the next Climbing Instructor course, available soon. Please plan to confirm your reservation for the climbing tower a week prior to your date by contacting Carolyn Cruson, Camping Registrar, as above. At that time, please let us know your group size, approximate ages and climbing experience, if any. When you arrive at the tower, all climbers will need to have health forms and permission slips, to be reviewed by the instructors. A copy of the parental consent form is available below.